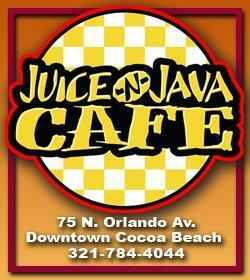 Address: 75 North Orlando Ave.
Offering Fresh Roasted Coffee on Site, Espresso Drinks, All natural fruit smoothies, Bagel Sandwiches, Breakfast Wraps, Panini Sandwiches, Soups and Salads! After 5 menu consists of pizza, flatbreads, quesadillas, nachos and artisan cheese trays. Wine bar with unique wines & many Craft beers. Free Wifi. We have live music Thursday - Friday nights with an Open-Mic every Saturday night. 7:00 PM - 10:00 PM Friday evening with The THREE Frogs The Tree Frogs We will be playing some great classic tunes from the '60s & '70s! Don't forget to bring your friends! 7:00 PM - 10:00 PM It's the Last Friday of the Month Vince Reed Band Kicking It up notch,Wow this is gonna be crazy good!